Can drones break the sieges? The lead story in our latest Syria Notes generated an interesting discussion at Tuesday’s event in Parliament on besieged civilians in Syria. 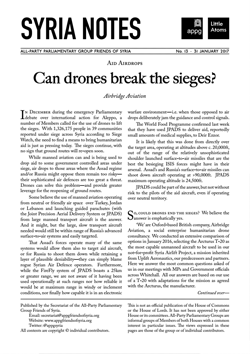 Can drones break the sieges? Eastern Ghouta, what is next? In December during the emergency Parliamentary debate over international action for Aleppo, a number of Members called for the use of drones to lift the sieges. With 1,326,175 people in 39 communities reported under siege across Syria according to Siege Watch, the need to find a means to bring humanitarian aid is just as pressing today. The sieges continue, with no sign that ground routes will re-open soon. While manned aviation can and is being used to drop aid to some government controlled areas under siege, air drops to those areas where the Assad regime and/or Russia might oppose them remain too risky—their sophisticated air defences are too great a threat. Drones can solve this problem—and provide greater leverage for the reopening of ground routes. Some believe the use of manned aviation operating from neutral or friendly air space over Turkey, Jordan or Lebanon and launching guided parachutes (with the Joint Precision Aerial Delivery System or JPADS) from large manned transport aircraft is the answer. And it might, but the large, slow transport aircraft needed would still be within range of Russia’s advanced surface-to-air systems and easily targeted. That Assad’s forces operate many of the same systems would allow them also to target aid aircraft, or for Russia to shoot them down while retaining a layer of plausible deniability—they can simply blame rogue Syrian Air Defence operators. Furthermore, while the FireFly system of JPADS boasts a 25km or greater range, we are not aware of it having been used operationally at such ranges nor how reliable it would be at maximum range in windy or inclement conditions, nor finally how capable it is in an electronic warfare environment—i.e. when those opposed to air drops deliberately jam the guidance and control signals. The World Food Programme confirmed last week that they have used JPADS to deliver aid, reportedly small amounts of medical supplies, to Deir Ezzor. It is likely that this was done from directly over the target area, operating at altitudes above c. 20,000ft, out of the range of the relatively unsophisticated shoulder launched surface-to-air missiles that are the best the besieging ISIS forces might have in their arsenal. Assad’s and Russia’s surface-to-air missiles can shoot down aircraft operating at >90,000ft. JPADS maximum operating altitude is 24,500ft. JPADS could be part of the answer, but not without risk to the pilots of the aid aircraft, even if operating over neutral territory. So, could drones end the sieges? We believe the answer is emphatically yes. ‘We’ are Oxford-based British company, Airbridge Aviation, a social enterprise humanitarian drone consultancy. We conducted an extensive comparison of options in January 2016, selecting the Arcturus T-20 as the most capable unmanned aircraft to be used in our not-for-profit Syria Airlift Project, a mission inherited from Uplift Aeronautics, our predecessors and partners. Here we answer the most common questions asked of us in our meetings with MPs and Government officials across Whitehall. All our answers are based on our use of a T-20 with adaptations for the mission as agreed with the Arcturus, the manufacturer. Can drones deliver meaningful amounts of aid? Yes. Using just nine drones flying twelve hours a day at 50nm range we could deliver around >1800kg of aid per day, feeding >1675 people to their full nutritional needs—and of course this would feed greater numbers in extreme circumstances. Each aircraft carries circa 36kgs per sortie. Move to 24 hour operations and nine drones can deliver 5200kgs feeding >9850 people a day. Do drones have the range? The T-20 has maximum range of 500 nautical miles, enabling us to reach Damascus air drop and return even if operating 70 miles from the border within the security of NATO’s Incirlik Airbase. Operating from Lebanon or Jordan also would enable us to reach anywhere within Syria. No. The T-20 is launched from a pneumatic rail launcher that is set-up in less than 10 minutes by two people. It can have an aircraft in the air in 15 minutes and can launch from just about anywhere. We air drop our aid in the form of the air-droppable humanitarian daily ration—there is no need to land when we release our aid over the areas under siege. The T-20 belly-lands when it returns to base needing just 20-100 metres to stop. It needs only a farmer’s field, track, meadow, sports pitch or other open area in which to land. No runways required. Wouldn’t they get shot down…? Of course the key attraction of using drones is that they are more expendable – even if they get shot down no lives are lost, and they are relatively cheap compared to manned aircraft. But they are also very difficult to shoot down. Our drones have a 5 metre wing span, significantly smaller than any manned aircraft that would be used in this role, and the smaller fuselage and low infra-red signature ensure the T-20 has both a low radar cross-section and a low heat signature. This makes it difficult to target, even with the most effective surface-to-air missiles and anti-aircraft artillery. For example, in July 2016 a drone—possibly Russian built—left Syrian airspace and flew into Israel. It was widely reported in both the Israeli and international press that neither Israel’s sophisticated US surface-to-air Patriot missiles nor its air defence fighters were able to shoot it down. … or jammed using methods of electronic warfare? This should be the biggest concern for anyone considering using drones to relieve areas under siege—Russia has jammed OSCE drones in Ukraine, and jamming is invisible and deniable. Our drones can operate using both a datalink back to their controllers as with most drones—and at range this can be jammed. But they can also be controlled from a satellite, making jamming far harder. Finally, they are also capable of operating fully autonomously using their onboard systems for control. This is virtually impossible to jam, and while it can affect accuracy, particularly in high winds and long ranges, in most cases it would enable us to operate effectively—returning to base autonomously if needed, but more likely picking up the control signal as the jammer gets more distance. The cost would be $2.6 per kilo, or $2.3 to feed one person to their full nutritional needs for 24 hours. Although government money would help, and political support is essential, we have a tie-up with a major advertising agency, philanthropic partners and a corporate sponsorship option. We are confident that we could part-fund through crowd-sourcing money globally, supported and supplemented by philanthropic and corporate social responsibility monies. Could the UK’s military drones be used to drop aid? Maybe. In Autumn of last year we partnered with General Atomics (GA), manufacturers of the Predator and Reaper drones. Together, we designed a Predator C for aid delivery, re-designating it the Angel-1 for the humanitarian role. The UK operates a fleet of MQ-9 Reapers, from the same family of aircraft. While it might be possible to repurpose them, the expense of doing so makes it unviable. The benefit of using GA’s Angel 1, which we are still positioned to enable, is its payload -c.1500kgs; the risk is greater than if using the T-20 though—this is a large aircraft with a wingspan of 20 metres, easily targeted, expensive and likely containing much high tech equipment that the US would not be prepared to have compromised should the aircraft be shot down. So how would a drone delivery operation work? Pending diplomatic approval, our drones would operate from Turkey at first, later expanding operations to Lebanon and Jordan. Taking off from existing aid hubs our aircraft should conduct their solely humanitarian mission under the white markings of an aid agency (e.g. the World Food Programme), flown and operated by us and our partners. Flying out to the besieged area the aircraft would descend in spiral over the area under siege to minimize exposure to hostile fire from besieging forces. Aid would be littered across the besieged area, making it difficult for militias to control, to prevent hording and enable residents to access it quickly as well as avoiding people having to gather in one area to collect the aid, where they could be easily targeted. The aircraft would return to operating altitude and fly back to base, skidding to a halt in a field next to where they took off before being refueled, reloaded and back on the rail ready to go within 30 minutes. Meanwhile, other waves or our aircraft would have been launched and on route to or from the besieged area, supplying a continuous stream of aid. Great—how soon could drones be delivering aid into Syria? We currently plan on 90 days from contract award to the deployment of our first aircraft, though it could be less depending on the manufacturing demand at Arcturus at the time. This has been used as a reason not to take the proposal forward, as it is only ever considered at the peaks of a crisis when a solution is needed tomorrow. However, if the UK takes a longer-term view, the signing of a contract now could have deliveries in place by late April. Are there really no obstacles to deploying drones to lift the sieges? There remain political reasons not to proceed with air drops. They could be seen as escalatory and increase conflict between the UK, the regime and their Russian allies. Committing to the air drop could also lead to increased pressure for the UK to do more, either now or in the future, which may not be in the national interest. But we do not know of any technical obstacle to deploying the drones, and believe it is important that unfounded technical objections must not constrain political and humanitarian options. Are there any other benefits we should consider? Proceeding to contract and visibly testing the technology would increase leverage for aid agencies in humanitarian negotiations with regime forces for ground access to sites under siege. Aid agencies report that when the UK gave serious consideration to air drops in Summer 2016, this quickly led to improved access for ground convoys. The threat of an unmanned air drop may be enough to coerce those leading the sieges to lift them, at least temporarily. Frustrated in our efforts to win government support we are planning a full capability demonstration in the US for Summer 2017. Concurrently, we are working with partners Windhorse Aerospace to develop a drone designed specifically for the delivery of humanitarian aid. Having read this, how can I help?